Who Shall Have Natasha's Heart? What do you do when the one that your heart desires is suddenly plucked away from you? That is the question that Natasha is faced with tonight. Over the past few weeks it has become evident to Africa and all of the Housemates that the vibrant Malawian has a soft spot for the Angolan gentle giant that is Biguesas. Yesterday the pair enjoyed an intimate dinner for two in the Rendezvous Room where it became evident just how much the vivacious lady relies on his companionship. She opened herself up to him; chatting about all her woes inside of the Ruby House. The southern gentleman listened attentively and then gave her stellar advise. From the looks of things it seemed as if something romantic could eventually brew between the two. But tonight the Diamond fellow was sent home packing along with his fellow countryman Neyll and now a void has been left in the Malawian’s life. So who will be the one to fill that gap? Should Natasha find herself another male suitor in The Chase or should she stay by herself? Who will do dat? Her only game is gossiping n nousing in odas bizness.d only person dat can date her is Zulu d taxi driver! 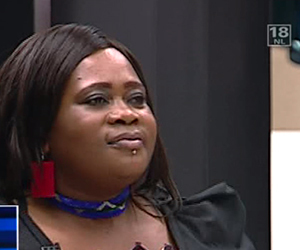 !biggie u 4evict 3hsemates today now!EisHhhhhhhhhh!